Once you start writing some of your own music using an on line music writing application (start up cost for some programs is free), you'll begin to realize how much you enjoy composing, that it's wonderful, and that people will encourage you to keep it up. There just isn't any struggle and strain any more over staff paper, quill or fountain pen, inkwell, and sometimes poor lighting as in bygone centuries, to write your own music. Nowadays all one needs is the necessary electronic means (internet access, notebook PC, photocopy machine, online music notation software), supplies (black ink cartridges, copy paper), and a little time and attention to produce a well crafted, beautiful composition for the organ in a matter of just a few days. The proof of this is posted all over this web site. Now and then however, it's relaxing to just sit at your own beautiful, personal instrument, if you have one; be ever so thankful to a Higher Power that you have it while you play some soothing works of the masters or perhaps some of your own original work; let the string and flute Celestes fill your ears and heart with the calmness they induce while you induce a melody of intrigue played on the lyrical and plaintive Oboe or some other color reed stop. If you can also find a nice 2 part canon with your theme, good 2 part canons on quiet stops can be relaxing to listen to and suggest contentment [See blog, Canon, Parts I, II, III, IV]. It's great therapy and totally organic, no artificial additives, and you can't overdose. This prescription has worked for many organists in the past, including myself. You, your life, and your composing are in the hands of a Higher Power; there's no better place to be; we may not understand why He takes us where He does, but we do have great faith that HIs path for our life is blessed by Him. In other postings [See blog, Prism, Getting Started With Writing, Parts II, VI, X] it was suggested that the thematic material for a composers' piece be shined through the prism of their own life experiences to give it a shape; composers often can find beauty this way when they believed, or were told, that there was none. Pastorale in Ab Major Op. 12 (photo) is an example of this type of music. In this work the composer makes use of 2 themes, one suggestive of his mother's love and the other being playful which suggests his own childhood; these themes are treated profusely with canonic imitation in ternary (ABA) form before being combined at the end and tagged with a very tender coda. 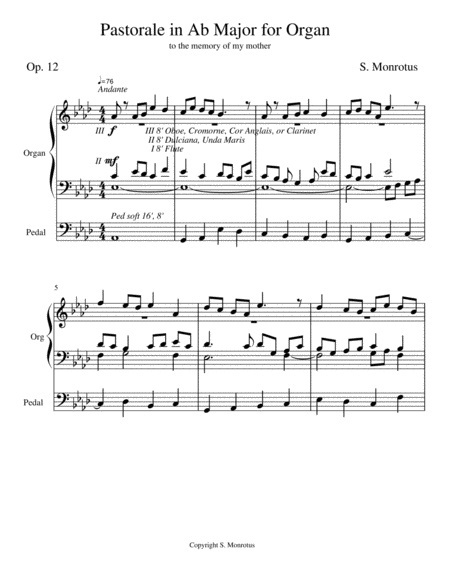 In the first A section the 1st theme, 8 bars in length, is presented as a solo voice in the soprano against held notes in the left hand and a slowly moving bass line in 4 voice texture; a nice color reed stop [Oboe (Hautbois), Orchestral Oboe, Cromorne, Clarinet, Cor Anglais, etc.] of contrasting tonality on a different manual can be used here against string celeste tone to bring out this melody. If the instrument happens to have a Trumpet stop in an enclosed division, and it isn't unduly assertive, this voice might also be used for the melody line with the box closed. This same type of tone color can be used to bring out any line throughout the piece at the discretion of the performer. The music then modulates calmly to the dominant key (Eb) using a sequence [See blog, Sequencing] based upon the final 2 bars of the theme; the echoing effect helps develop your thematic material and better cement the theme into the ears of the listener. Now comes something akin to mission impossible: this theme is then presented in inverse movement [See blog, Inversion] and treated as a 2 part canon at the octave between the soprano (follower) and bass (leader) at a distance of a half bar; meanwhile the tenor voice carries the theme right side up against the other 2 lines at a distance of a quarter bar, creating a 3 part canon! The idea here is to think horizontally with your moving lines so that, at any point along the way, a vertical slice through any point of any measure will dovetail to make consonant harmony. In this 3 voice canon 2 notes of the theme in the tenor line were "tweaked" tonally to get them to "fit" in vertical harmony with the outer voices without creating dissonance. It would be instructive to have a close look at this score and study how the composer was able to get away with this. While this 3 voice canon is going on an added free voice in the alto squeezes itself between the soprano and tenor lines to continue the 4 voice texture. If that wasn't enough, another 3 voice canon at the octave immediately follows in which the bass line (follower) trails the leader (soprano) at a distance of one bar with the theme this time in inverted retrograde [See blog, Retrograde]; the tenor line meanwhile plays the theme right side up in retrograde at a distance of a half bar ... with a free voice in the alto preserving the 4 voice texture! These kinds of contrapuntal acrobatics, when you can get them to work, can be looked upon as a signal achievement in your writing for the organ. After coming to a complete stop on the tonic chord (Ab), the music modulates to the dominant key (Eb) for the B section; it begins with a lone statement of the first 2 bars of the playful 2nd theme in the tenor line, using segmentation [See blog, Segmentation]. This 2nd theme is 8 bars long and deliberately worked to blend in harmony with the 1st theme; it's also constructed with a dotted rhythm in quicker notes articulated with staccato dots here and there to give it character and throw into higher relief its difference from the 1st theme. This 2nd theme is then presented in the bass with a free voice added in both the soprano and tenor to fill out the harmony. After 4 bars of this, the 2nd half of the theme then switches to the tenor line, a free voice continues in the soprano, and the texture reduces to 2 voices as a bicinium. The music then proceeds as another 2 voice canon at the octave with the theme carried in the bass in augmentation [See blog, Augmentation / Diminution]; the soprano meanwhile carries the theme with a free voice added to the tenor, restoring a 3 voice texture; all 3 lines begin at the same time. Halfway through this augmentation canon the theme switches from the soprano to the tenor line and is repeated while the theme continues in augmentation in the bass and the free voice moving to the soprano; this free voice is punctuated with staccato dots in appropriate places in imitation of the 2nd theme. After coming to another complete stop on an Ab chord, the 3rd section begins with a repeat of the 1st theme in the subdominant key (Db). This time the 1st theme is treated as a 2 part canon at the octave right side up between the follower (soprano) and leader (bass) at a distance of one bar; the tenor line meanwhile repeats the theme right side up at a distance of a half bar, thus creating another 3 voice canon as the 3 voice texture continues! Typically, in our writing, we avoid crossing voices, particularly the tenor and bass, and keep them in proper order from highest to lowest (SATB); one RARE occasions crossing of voices is justified IF it improves voice leading. This 3 voice canon is one of those rare occasions; here the tenor and bass lines cross in several places in order not to disturb the voice leading and all the wonder of the imitations going on. Another sequence of 2 bars leads the music back to the tonic key (Ab) where yet another 2 part canon at the octave is presented with the 2nd theme between a leader (soprano) and a follower (bass) at a distance of one bar; meanwhile the 1st theme is repeated in the tenor line against this canon at a distance of a half bar as both themes are at last combined in a 3 part canon. A nice color reed stop is very effective here as well, to bring out the 1st theme in the tenor line. The slowly moving bass line then carries the music into a short coda of 4 bars where the music ends very longingly, sensitively, and quietly. The final cadence breaks a rule by placing the leading note (7th scale degree) in the bass; here again, life improves dramatically when someone decides to break the rules and finds beauty when they were told none were there. There is much, very much to recommend this piece not only for study but for "therapy"; its multiplicity of canons in their various combinations, inducing a calming effect, is relatively unique among other works written for the organ.